As with Microsoft Access 2007, the RTM code for Microsoft Access 2010 also seems to have a problem updating the Access Object library reference in the registry on x64 computers (mine happens to be running Windows 7 Ultimate x64). Below are some of the symptoms you may encounter. The fix is a manual one: Do a search of your registry for the path to the Access 11 MSACC.OLB file (i.e. search for “C:\Program Files (x86)\Microsoft Office\OFFICE11\MSACC.OLB”). Modify the registry key it finds to the Office14 folder instead. My computer configuration is a Windows 7 computer with Microsoft Access 2003 installed from the Microsoft Office 2003 setup routine. I also have my application installed, which installed Microsoft Access 2003 runtime to C:\Program Files (x86)\Access 2003 Runtime\. The main access windows gets displayed. If you actually reboot, and then try to re-open the app, the exact same process happens – endless cycle of configuring / reboot prompts. 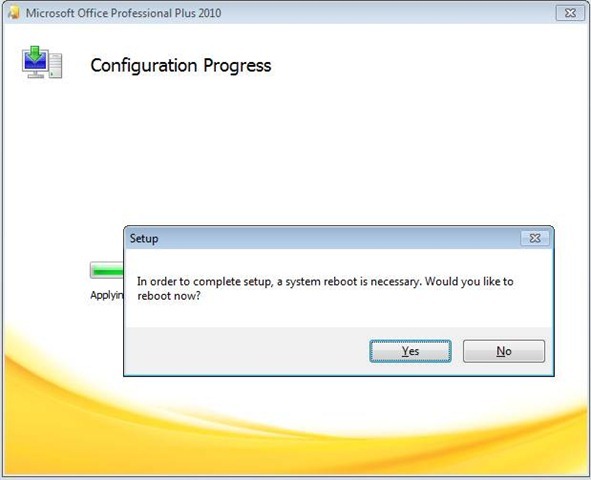 Rebooting, running a repair on Office does not fix this problem. If you get this problem, it seems the only fix is to edit the registry manually using the instructions above. If this solution worked for you – leave a comment. Hi! Thanks a lot for this hint, works fine. Ran into this problem and pleased to discover your solution which worked beautifully. Thanks for sharing!